From the late 1960s until the mid-1980s, the influence of Marxist ideas expanded in sub-Saharan Africa. The Catholic Church saw this influence as likely to affect the accomplishment of its mission, and its pastoral efforts accordingly sought to deal with the Marxist thrust. In the late 1980s, Marxist influence in Africa declined sharply as Marxist political dominance became less intense. Nevertheless, the Church's encounter with African Marxism constituted an important chapter in both secular and ecclesiastical history. Finding a Social Voice records and analyzes the significant elements of this encounter. Father McKenna's book investigates how postcolonial African regimes under varying degree of Marxist influence have interacted with the Catholic Church, and studies how the Church has grown through its response to that interaction. The book contributes greatly to the virtually unexplored topic of church-state interaction in contemporary Africa. 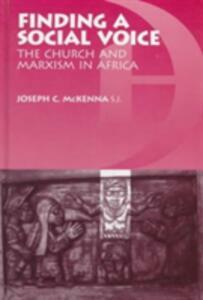 McKenna's claim that the Catholic Chruch's response to Marxism was a "part of its coming to maturity," part of its bringing its social perspective to bear on the processes of political, economic, and social modernization through which traditional cultures were passing, is an important contribution to the more recent literature on the emergence of "civil society" in Sub-Saharan Africa. The text also provides an introduction to post-Vatican II understandings of ecclesiastical activity in Africa. It reviews the theory and practice of Marxism as developed by Marx, Engels, Lenin, and the leaders of Soviet Russia and other Communist countries. It then presents an overview of the ways in which Marxist influence worked in Africa and a similar overview of how the Church functioned and was affected by that influence. Finally, the book offers case-studies on the interaction of Marxism and the Church in four diverse Africa countries: Mozambique, Madagascar, Zimbabwe, and Zambia. The introductory chapters make this book accessible to the general reader; the book as a whole is an enrichment of our understanding of contemporary Africa.